The world is a big place for babies, especially animal babies that live on the wide, wide African plain. 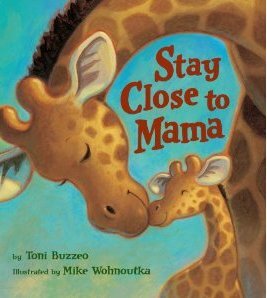 In Stay Close to Mama, by author Toni Buzzeo, Twiga the baby giraffe is mesmerized by all there is to see in the world. There’s lovely green grass and sweet-smelling flowers; curious termite hills and musical sounds coming from the tall, tall trees. Of course, Twiga’s nervous mother warns him to stay close, but with the mindless spontaneity of a typical baby, he doesn’t listen. He ambles off across the plains all by himself, never seeing the crouching hyena watching him with hungry curiosity; never noticing the glaring eyes or snapping jaws of an alligator hoping he’ll make the wrong move in the water; never thinking that the leopard watching from a nearby tree plans to grab him as he plucks a sweet fruit from its branch. Thank goodness Twiga finds his way back to his doting mother, but… who knows how long he’ll stay? The world is, after all, a very interesting place! Stay Close to Mama is a sweet book with even sweeter prose that teaches babies and toddlers alike that feeling curious is natural, but the wonderful things to discover in this world should be discovered under the doting shadow of a loving and protective mommy. I love how this book is fast-paced and full of adventure. The characters are believable (even if they are animals), and the very real dangers lend an exciting bit of tension to the story. I also love how artist Mike Wohnoutka uses deep, rich earth tones in his illustrations. His characters are big and tall and his spaces are open and wide, lending a bigger-than-life feel to the pictures and the accompanying story. Stay Close to Mama emphasizes love, family, safety and growing up, and should be a welcome addition to any elementary science classroom, any early reading program, or any child’s private library. 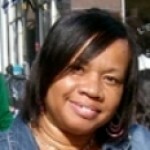 For a sweet story about curiosity and adventure, be sure to read Stay Close to Mama.